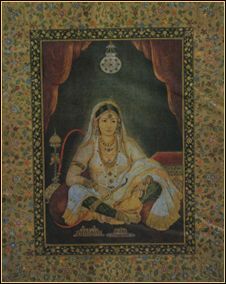 Narghile is popular as well as with men as with women, as well as with young people as with their elders. Indeed, it symbolises familial conviviality, serenity and harmony. 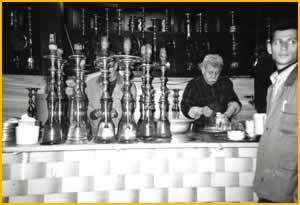 A Lebanese woman said how in Beyrout, during the long war years, the family and the neighbours took the narghile with them down to the cellars. So, it has been a close companion during those dark periods. In the same city, the organiser of a narghile festival points out how the place where this event takes place - Beyrout's wood, near the racecourse -, was symbolically chosen. It mapped out, during the civil war, the demarcation line between both parts of the capital. In brief, today, the use of narghile in this country is assimilated by many observers to the come back of peace. Consequently, on the terraces of cafés and restaurants, the artefact makes, without any moods, an exhibition of itself. This country harbours today a prosperous narghile industry which exports to many countries of the region an impressive variety of water vessels and other essential elements of the artefact. Numerous shops have exclusively specialised in them. In Syrian cafés, it is quite common to play backgammon, draughts, chess or cards, etc. Their space and decoration, sometimes vast, are, by comparison, more restrained than those of the Jordanian sophisticated and intimist "coffee shops". 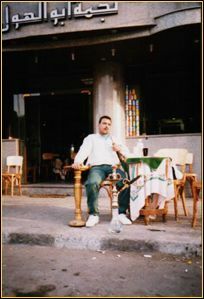 One of them, the Maqhä 'el-Hijêz, near the central railway station of Damascus, evolved, in some years, to propose to its customers, in the very place, a modest shaving and hairstyle salon… The same establishment also covered its terrace with vine arbours and decorated it with fountains. Smokers are rather old persons, like patrons of the Nûfara café near the great Omeyyades Mosque. 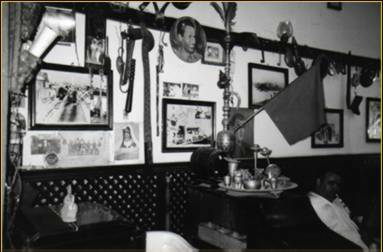 This last coffee-house is one of the last establishments where an old tradition, that of the story-teller, is maintained. At twilight, the latter comes in and sits down on his big raised armchair then begins or resume the reading of semi-legendary tales which enthral a constant audience. As such stories are generally very long, narghile pleasantly helps listeners to go on paying the necessary attention. finally, If one hardly sees narghile smokers reading a newspaper or a book in countries like Jordan, Tunisia or Yemen, they are not rare in Syria. Moreover, their "seriousness" can rightly be compared to that of pipe smokers in Europe. In the western part of Amman, its capital, "coffee-shops" with wide terraces and a sophisticated decoration are numerous because people living in the corresponding zones can afford to frequent them. In the Eastern part (downtown) and its popular districts, there are no establishments of the above mentioned type; coffee-houses are there "Oriental cafés". An architectural peculiarity of Amman's coffee-houses is to be often located on the upper floors of buildings, even when, sometimes, there is enough space on the ground level. 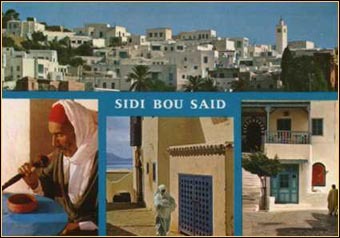 So, we can find: "Maqhä 'sh-she'b" (People's café); "'Urûbé" (The Nation, understood as its Arabian character and identity, or conversely) in front of the main mosque; "Balât 'er-Rashîd" (the Caliph's palace - Harûn) occupying a whole balcony looking on to a thoroughfare; or "Central café" which still possessed, some years ago, a terrace overhanging the heart of the swarming downtown area, etc. As for "Zahrân café", in front of the city hall, its patrons are essentially old persons who generally smoke tumbâk. If backgammon is sometimes played here, many would rather play cards, a game apparently appreciated by Jordanians. The Palestinian people has been longing for freedom for more than fifty years. 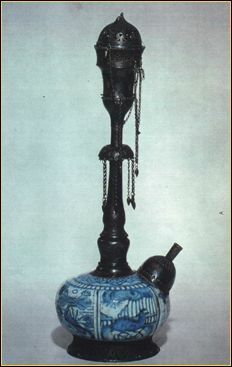 The narghile (hookah) is one among several of the symbols of their oppressed culture of every day's life. Like the olive branch they have always ben holding out, Palestinian women and men are always ready to share their peace pipe with all those for whom justice is not only a word but a right, irrespective of their religion or skin colour. Salam! Shalom ! for a joint future of peace ! Turkey, to which people always look at, is not any more that country where Pierre Loti, a great amateur of narghiles, could, at the beginning of the nineteenth century, count the latter "in myriads". Today, those places fitted out to devote to this art (sometimes called "nargile bars") can be listed on one's fingers, often under the questioning and amused glance of tourists or the interested eye of some journalist about to write a light article on them. Most of the famous cafés where the peculiar narghile atmosphere prevailed actually disappeared: Pirinçci (in Kuledibi); Güllü Agop Kiraathanesi (in Gedikpasa); Valide Kiraathanesi (in Eminönü); Ligor Kiraathanesi under the Galata bridge; and Erzurum Çayevi. The districts where the "survivors" are to be found are those of Beyazid, Aksaray, Topkapi, Unkapani, Kasimpasa, Besiktas and Kadiköy. In the first one, the Erenler coffee-house calls on foreign guests to try what a signboard presents as the "mystic water pipe". Notwithstanding, this country is now experiencing a revival of narghile, even if the State makes every effort to lighten the Turkish society of its heavy cultural and social Ottoman past. At the beginning of the last century, the only and last identified social use of narghile is that performed, between the twenties and forties, by Greek "immigrants" in Turkey. These were at the origin of Rembetiko, a culture in conflict, in spite of itself, with the values of the global society of that time. Here is, below described, their daily living environment in the Piraeus harbour: "In one of the small shops, you could have drunk a thick, sweet cup of Turkish coffee and ordered a water pipe or narghile, which the proprietor would lift off a shelf and light with a few coals from the charcoal brazier. Smoking would have appeared in this country at the beginning of the seventeenth century. Today, in this country more than in any other, the narghile makes an exhibition of itself almost everywhere and in every place. An interesting question is to know if the powerful film production of this country, massively broadcast on the regional scale, has been in a position to influence smoking behaviours in other countries. In the latter, such behaviours would have been at the origin of a revival of narghile as in Tunisia, Syria, Lebanon or Jordan. 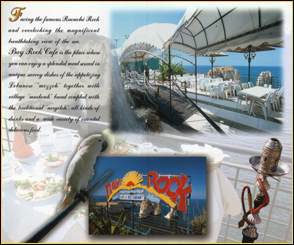 Narghile in Egypt, under its two forms, shîsha and gûza, is indeed well known through television programmes. In this country, its use is for tobacco what kushary, a dish based on rice, pastas and lentils, is for local cooking: popular, of frequent and daily consumption. 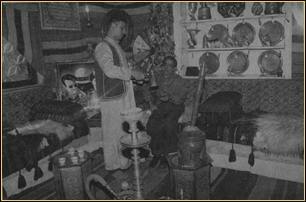 The "'El-Fishâwy" coffee-house, in the "Hân 'el-Halîly" district of Cairo, is famous for the hundreds of daily bowls, filled with mu'essel, it prepares for its patrons twenty four hours a day. Its existence is bound to the national literature with such writers as the holder of a world price: Najîb Mahfûz. This establishment would have known its highlight at the end of the twenties and at the beginning of the thirties. However, the combined effects of tourism on local populations, on one hand, and the fact that it distinguishes itself by a set of services organised around narghile, on the other hand, still seem to promise it numerous years of activity. 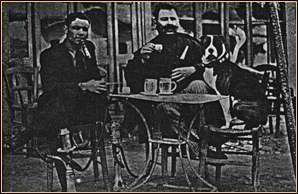 "In Tripoli's cafés, [how] the Lords were served the pipe and coffee by their slaves who always accompanied them […] Moors smoked pipes of the Turkish type or sometimes narghiles of the Persian form. The bey Sîdy Hamet smoked in a pipe decorated with gold, coral, amber and silver" (from French Encyc. du tabac). Before the come back of narghile from the Middle East in the seventies, the gûza, locally named "rguila", was especially associated, at the beginning of the century, to the use consumers of marijuana (tker(l) iyya) and hashish made of it. Today, only mu'essel is smoked out of shîsha. For some still not clarified reason, tumbâk is not used; the geographic limit for the use of the latter, through narghile, seems to be nearby Libya. A paid attention to the signboards of cafés, even the most modest, reveals how a good many of them tempt to the specific conviviality the pipe creates. The traditional and typical name is "Maqhä Shîsha"(narghile café). Rather absent of small villages, narghile shows a strong concentration in medium and big cities, as Sukra, Bêja, the capital and others. Authorities, worried in front of this "conspicuous" phenomenon, took dissuasive measures against it. Municipal orders were not made public but their source of inspiration hints at different ministries: of Health, Interior and Tourism. Café owners are called upon not to serve any more narghile on the terraces of their houses. Its use is only tolerated inside these last ones. It is possible to imagine a tourist who could not very well notice the pipe in this country, simply because unlike the shîsha, very conspicuous in coffee-houses of other cities of the Mediterranean region and the Middle East as Tunis, Cairo, Damascus or Beyrout, its practice takes place in a private context or away from the public glance. Besides, from a linguistic point of view, the word "narghile" is almost not used in this country without being unknown however. Indeed, the usual term is that of the main widespread form, that is the elegant and traditional "medê'a". Then, locally according to regions, one finds the "kûz" with its long stick and the itinerant "rushba", of small dimensions. 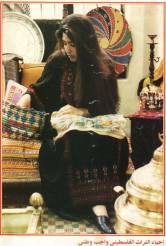 Finally, for some years, the modern shîsha did appear in this country, not without arousing strange hostile reactions among some who consider it as an intruder in the Yemenite society. 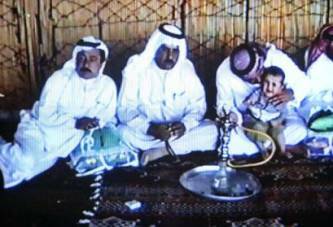 In brief, the practice of narghile is wide-spread in Yemen. However, the use made of it is particular because it overlaps another cultural custom well documented today: that of the ritual consumption of qât. 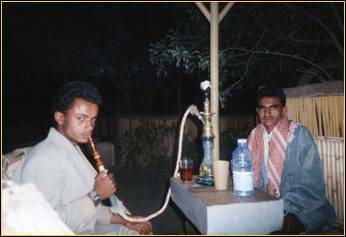 Yemen, more than any other country, maintained very long-lived this traditional use of tobacco which, with that of qât, shapes, for its peoples, a real life-style. Qât and narghile have so common points and affinities that they are, in the eyes of Yemenites, two of a kind or an ideal couple, would it be only because of the time they dedicate to both activities. "These bottles are usually full of flowers for the entire satisfaction of eyes. At least once in the daytime, water is changed after it is quite corrupted and stinking because of the tobacco spirits. I tried a cup of this water and I felt that it is a quick remedy to vomit up my intestines" (from French). In current modern Iran, the narghile life-style continues. For instance, in Darban, a small town in the South of Teheran, women, alone, accompanied with their husband or mother, find the road of traditional tea-houses, in an "atmosphere of holiday resort, delicious: sat down on a carpet, people come there at least once a week to sip its tea, to nibble at dates and smoke a ghalian - a narghile, and speak freely" (from French - T. Rocher). 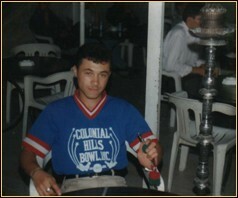 This country has known a historic use of hookah. Narghile was, in 1840, very common during dinners, at officers' tables, and its typical gurgling could be heard till late in the night. Old Indians even kept this custom when travelling abroad. A Scottish lady is also reported to have gone on smoking narghile for several years after her return to her home land (Yule &Burnell). Let us mention here a characteristic of the British Crown aristocracy so aficionada of narghile: that of the "hooka-burdar" (from the Persian "hukka-bardâr", i.e. a hooka-bearer), a servant in charge of the full-time maintenance of his boss' narghile, also to be found in Persia' shahs or contemporary Yemen. "Farther, on what was Jod-e-Maiwan, a thoroughfare where shops were falling into line and where, sat down on carpets, talkative peaceful Kaboulis formerly used to drink tea and smoke narghile, fights sometimes break out from a house to the other through shell-holes..." (From French - Le Monde). Afghans smoke narghile through a reed, never through a flexible hose, coiling up like a snake, massively used in many others countries. Nowadays, water is not flavoured any more, as H.W Bellew already reported in 1863. For its combustion, a charcoal named mangal or buhari is used. However, dried horse-dung may sometimes replace the latter, as also observed in nearby India. "Chillam", as is called the Afghan narghile, is generally smoked at home or inside tea-houses. Tobacco is scarcely inhaled "dry", that is without water in the vase. Hashish (chars) is also consumed. Young people seem to lose more and more interest in the chillam, preferring cigarettes to it; an evolution which one can observe almost everywhere in the world (C.-J. Charpentier). The "Bang" pipe, made out of a big bamboo containing water, in which the bowl comes to fit obliquely in it. It is made of bamboo, engraved or inlaid with mother-of-pearl wood. This model particularly draw the attention of cannabis consumers, particularly American, who adapt it every day and endeavour to improve it in order to reduce the risks for their health. In their own vocabulary, it became the "bong". 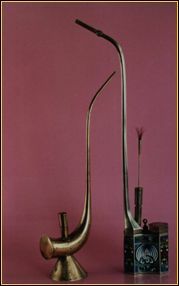 The pot-like pipe, in which the main element is the water vessel. It is made of bamboo or wood decorated with silver or mother-of-pearl.